Providing you the best range of vertical multistage inline pump, vertical multistage centrifugal pump and vertical multistage pumps with effective & timely delivery. Motor Insulation Class Class "F"
Vertical Multistage High-Pressure Pumps (AV, AVI, AVS & AVN Series) are nonself priming pumps of In-line Design. A flange or with Victaulic coupling with equally sized suction and discharge ports. Stage construction with Stainless Steel impellers, diffusers and outer tube, Pump shaft and Motor shaft are of lEC Standards. These Pumps are driven by Totally Enclosed Fan Cooled (TEFC) high-efficiency AC Induction motors. Highly suitable to use in R.O. systems for drinking water. Cartridge type mechanical seal for easy maintenance and minimum downtime in case of replacement. AC Induction motor with "F" Class Insulation suitable for continuous duty. 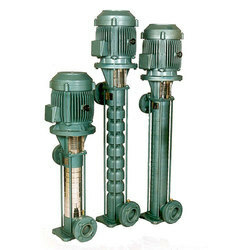 These Energy efficient pumps are Reliable and require minimum maintenance. Squirrel cage totally enclosed fan cooled 2 poles standard motor. 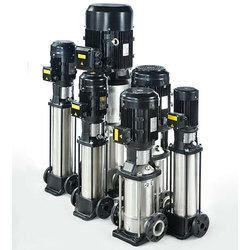 Boosting water pressure in Reverse Osmosis Systems, water softener, and ultra filtration systems. Hydropneumatic pressure boosting systems and water transfer systems. Sprinkler irrigation systems for Golf courses, Sports stadiums, and Agricultural fields. Boiler feeding and Industrial washing/cleaning systems. Vertical Multistage Centrifugal Pumps (AVRE, AVRS and AVMS Series) are reliable and rugged construction. They have proven their performance over many decades. A wide variety is available to suit high pressure applications.